I just finished Dewey: The Small-Town Library Cat Who Touched The World by Vicki Myron. Amy, from My Friend Amy sent this book to me as one of the giveaways for Book Blogger Appreciation Week. Thank you Amy! On a cold night in Spencer, Iowa, Vicki Myron hears a noise coming from the book-drop of the Spencer Public Library. With the assistance of another librarian, they pull out a near frozen kitten…weak and completely matted with dirt. It’s at that moment that Vicki realizes that things at the library will never be the same. It doesn’t matter if you are a cat lover, or a dog lover, this book is charming and sweet and any animal lover will be able to relate to Myron’s story about a cat that managed to work his way into the hearts of library patrons everywhere. Much of the story is about Dewey’s antics and his relationship with the staff and patrons of the library but what I really enjoyed were the little tidbits Myron shared about the town, the economy, what it was like to live in a “corn” state, etc. I really got a feel for the town and the people that lived there. Also, my feline friend of 17 years passed away this past Valentine’s Day so I could certainly relate to the bond Myron had with Dewey. Anyone that has had both a cat and a dog at once can tell you how different cats are. They are just… stumbling for a word here…different. They are self-sufficient but often choose not to be. Anyway… this book would make a wonderful Christmas gift. It gave me the warm fuzzies. It was also on my Fall Into Reading 2008 list so I am happy to cross another book off that list. Progress. Yes! 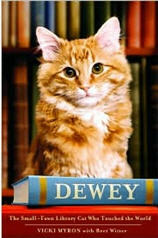 If you’d like to read more about Dewey’s life, click here for his bio. Dewey was a pretty amazing cat, that’s for sure. Great review Ti! I can’t wait to read this one-it sounds like such a lovely read. Sorry about losing your feline friend.. I keep reading such good reviews of this one! It <>would<> make a good Christmas gift for a couple of people I know. And me. LOLOLOL! So glad you are making progress on your challenge. I, on the other hand, have not…lol! In 2009, I won’t be listing so many books.